Transporting and relocating dogs is an increasingly common practice. Whether the situation is an owned pet accompanying emigrating or traveling caretakers, the relocation of homeless animals for adoption, or the movement of dogs for competition, exhibition, research or sale, this process carries the risk of spreading infectious diseases.This includes the transmission of Dirofilaria immitis when infected dogs have become microfilaremic. 1. Test all dogs greater than 6 months of age for microfilariae (Mf) and heartworm antigen (Ag) prior to relocation. a. If testing is not possible, assume transmission is possible and proceed to Step 3b. 2. If dogs test positive for microfilariae or antigen, reconsider relocation at this time and begin treatment in accordance with the American Heartworm Society (AHS) Guidelines. a. Dogs with clinical signs attributed to heartworm infection should not be transported. b. Dogs that have been treated with melarsomine dihydrochloride should not be transported for at least 4 weeks after an injection to minimize stress and physical exertion that accompany the relocation process. 3. 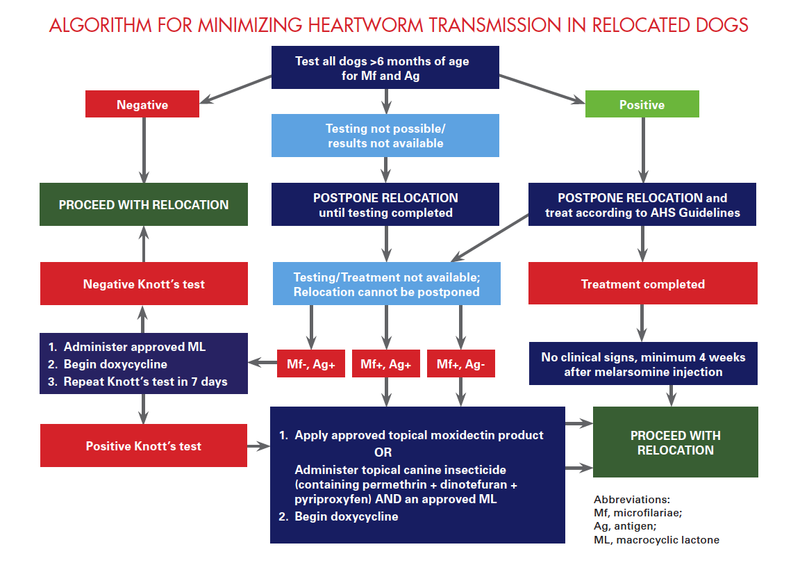 If dogs test positive and relocation cannot be postponed, clinical decisions should be based on the dog’s heartworm status. iii. Repeat Knott’s testing in 7 days; if negative, proceed with relocation. If positive, repeat Knott’s testing in 7 days. Two negative tests 7 days apart can provide reasonable assurance of a lack of circulating microfilariae and reduced risk of transmission. i. Apply an approved moxidectin topical product and proceed with relocation. Once heartworm-positive dogs have been safely transported, heartworm treatment should be completed according to AHS Guidelines as soon as possible. 4. If dogs test negative for microfilariae and antigen, proceed with relocation. Caring for dogs that undergo relocation is an everyday challenge veterinarians face in today’s mobile society, and one that necessitates the adoption of approaches to mitigate heartworm transmission. 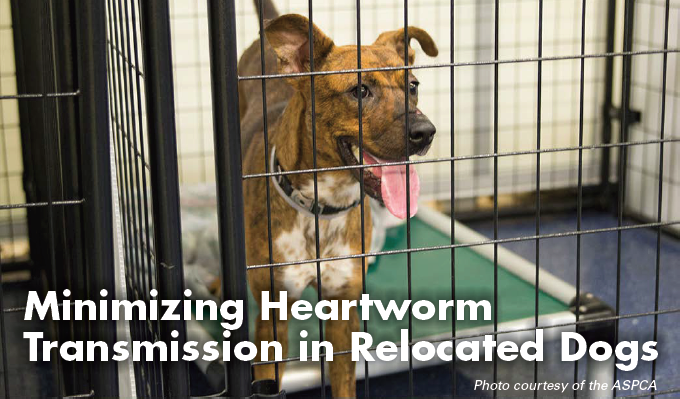 In the case of organized homeless animal relocation programs, veterinarians should work with both source and destination organizations to establish protocols for minimizing transmission of infectious diseases, including heartworm disease. 1. American Heartworm Society. Current Canine Guidelines for the Prevention, Management, and Diagnosis of Heartworm Infectionin Dogs. Available online here. 2. Hoerauf A, Mand S, Fischer K, et al. Doxycycline as a novel strategy against bancroftian filariasis – depletion of Wolbachia endosymbionts from Wuchereria bancrofti and stop of microfilaria production. Med Microbiol Immunol. 2003; 192:211-216. 3. Rossi MID, Paiva J, Bendas A, et al. Effects of doxycycline on the endosymbiont Wolbachia in Dirofilaria immitis (Leidy, 1856) —Naturally infected dogs. Vet Parasitol. 2010; 174:119-123. 4. Bayer Healthcare LLC. Advantage Multi® Product Label. Available online here. 5. Blagburn BL, Dillon AR, Arther RG, et al. Comparative efficacy of four commercially available heartworm preventive products against the MP3 laboratory strain of Dirofilaria immitis. Vet Parasitol. 2011; 176:189-194. 6. McCall JW, Arther R, Davis W, Settje T. Safety and efficacy of 10% imidacloprid + 2.5% moxidectin for the treatment of Dirofilaria immitis circulating microfilariae in experimentally infected dogs. Vet Parasitol. 2014; 206; 5-13. 7. McCall JW, Hodgkins E, Varloud M, et al. Blocking the transmission of heartworm (Dirofilaria immitis) to mosquitoes (Aedes aegypti) by weekly exposure for one month to microfilaremic dogs treated once topically with dinotefuran-permethrin-pyriproxyfen. In Proceedings, 2016 American Heartworm Society Triennial Symposium. Parasites & Vectors, 2017, in press. 8. McCall JW, Genchi C, Kramer L, et al. Heartworm and Wolbachia: therapeutic implications. Vet Parasitol. 2008; 158:204-244. 9. McCall JW, Kramer L, Genchi C, et al. Effects of doxycycline on heartworm embryogenesis, transmission, circulating microfilaria, and adult worms in microfilaremic dogs. Vet Parasitol. 2014; 206(1-2):5-13. 10. American Veterinary Medical Association. Relocation of Dogs and Cats for Adoption: Best Practices. Available online here. 11. Association of Shelter Veterinarians. Guidelines for Standards of Care in Animal Shelters. Available online here.